You will sure to win brownie points when you give a gift of indulgence from our range of Pampering range of certificates. Always a well-loved gift especially around Mother's Day, our Pampering experiences offers a mixture of traditional beauty and spa-like activities. Treat that someone special with exclusive pampering packages, relaxing massages, beautiful makeovers, tranquil facial treatments and much more. A unique and memorable gift is the photoshoot makeover experience, giving participants an opportunity to explore a brand new look complete with hair, make-up and professional photography! Pampering is not just for the ladies, with several couples and blokes pampering experiences also available! Pampering has never been better. Relax and enjoy. Let yourself be pampered away while enjoying refreshing champagne. This is a mobile service that operates throughout Sydney. This mobile beauty service will come to you in the privacy & comfort of your chosen location. Operates Sydney wide. Enjoy a relaxing aroma massage at home. This mobile service offers a 2 x 60 min relaxing aroma massages with champagne and chocolates. 2 people will receive a relaxing aroma massage for the neck, shoulders and back. Indulge in the delicious chocolates and champagne on offer whilst you receive your treatments. 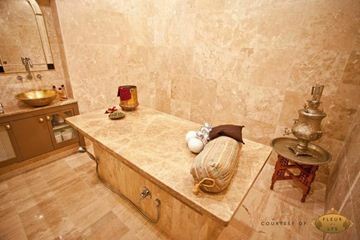 2.5 Hours Manicure, Facial, Pedicure, Massage..
Pampering has never been better. Relax and enjoy as you are pampered away whilst you enjoy delicious chocolates and refreshing champagne. This mobile beauty service will come to you in the privacy & comfort of your chosen location. Operates Sydney wide. 3 Minute Angels is the largest corporate and event massage treatment company in Australia. With an Australian-Wide network of Angels who can attend any location to give energising and relaxing 5, 10, or 15 minute seated massages. Take some time out to relax and enjoy a little pampering. The ideal gift for someone you know that needs and deserves a little pick me up in their home. Operates Sydney to Blue Mountains. This is a mobile service. Let us pamper that special someone for you. Spa Facial includes cleansing refreshing of the skin toning balancing your skin, exfoliating scrub for removing dead skin, hydrating masque adding all your every needs & completing it with a relaxing calming moisturiser massage. This is perfect for couples who need to unwind with a massage or facial treatment! Spoil them with a pampering day at an iconic location in the Mornington Peninsula. This package is a fabulous way to pamper a couple on a special occasion and give them a few hours together relaxing at a gorgeous countryside manor. There is no need to rush for this experience - take your time walking around the manor together and let yourself truly absorb the tranquil country atmosphere. Enjoy a sensational ‘Age Management’ skin rejuvenation facial treatment a Skin Peel as well as a bonus 20minute long upper body massage. Located in Paddington Fleur di Lys has a Moroccan décor and middle Eastern treatments. A great salon for a hens/bride to be experience.